It's the first weekend after a bitter and divisive election season, and no matter their party affiliation, Bay Area residents are drained. 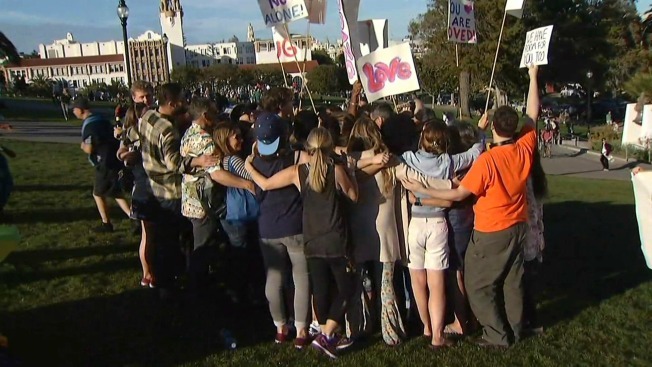 Some people in San Francisco decided to attend a group hug at Dolores Park on Saturday. "We feel like the entire country needed a hug after the election," Sarah Wheeler said. Wheeler, who organized the massive hug, said support can go a long way despite whether someone is relieved with the election results or needs to cry. "There's just been so much nastiness and bitterness and disappointment and bad feelings all over," she said. "Hugs generally make people feel better." The weekend could not have come sooner for Cheryl Dailey, who has turned to retail therapy for short-term relief. "I'm a little bit nervous, lots of anxiety, physically ill because of just not knowing what's going to happen," the San Jose resident admitted. Others picked up a frisbee. "It's been a weird four days, so [it's] nice to come out here in the sunshine and throw it around and not think ... too much," Eric Roberts of San Francisco said. Thousands banded together on Saturday as opposition to the newly minted President-elect unfurled across the United States, triggering yet another day of marches. Anti-Donald Trump protesters flooded streets in New York City, Portland, Chicago and Los Angeles. In the Bay Area, more than a hundred people marched in San Jose on Saturday, carrying flags and signs, and chanting, "Hey, hey! Ho, ho! Donald Trump has got to go!" The group did not disrupt traffic and stayed on sidewalks. Meanwhile, the Pantsuit Nation, a group of Hillary Clinton supporters, hosted vigils in Dublin, Palo Alto, Pleasanton, San Jose and San Francisco Saturday night. In the East Bay, Oakland protesters gathered again for a rally at Frank Ogawa Plaza. California Highway Patrol officers in Oakland were out in full force to quell any potentially violent behavior. A Facebook event page indicates that over 4,000 people will join hands around all 3.4 miles of Lake Merritt between 3 and 5 p.m. Sunday. A "Love and United Procession" is also scheduled to take place Sunday morning on San Francisco's Pier 7.